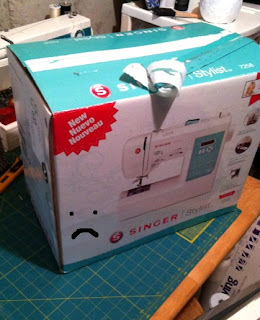 Is it me or does this sewing machine look sad? This was a Christmas gift from my parents and look at it. Still sitting in the box. Sad, sad, sad. I feel like I've been overexposed when it comes to handmade things. I need to stay off all design/project type blogs and websites to give my mind a break. Once I have an idea of what I want to make I end up seeing something else online that's even better and ditch the first idea. And it snowballs from there, ending with me having about 10 ideas a day for cute things but actually making nothing. Zilch. Nada. Zip. This can't go on. Time to see an idea all the way through. I'm great at starting things, it's the finishing part I'm not so good at. Gotta commit. With that said, the sad sewing machine will have to wait at least one more day. Today is all about finishing Valentine's Day cards before the mail comes. How about you guys, do you have any sad appliances around the house? What haven't you had the time to get to? My mixer is sad. My diet is preventing me from baking! Let's go Sis-you have TWO sewing machines. Get the new one up and running so you can let me know how it is! I've been itching to get one! Oh it's me-I must still be logged in to Mark's account! If your sewing machine is sad mine must be utterly depressed. My stepmom got me a sewing machine for Christmas 7 years ago and I still haven't used it once. Actually, I don't even know how to use it and have no desire to learn and don't know why she thought it would be a good idea to get me one in the first place. I guess it was an effort to domesticate me. Hopefully you can make some beautiful projects with yours! we have a sad, sad video camera. andy got it for me for my birthday. didn't want it and dont use it. he doesnt use it either. grrrr. i hate throwing money like that away. we do like the few videos we have, but just aren't into using it. birthday and christmas and that's about it. did you ever bust out the sewing machine? i think you need to name her too. our video camera joins yours and I'm sure many, many others! We never use it and never watch old videos. my camera takes video, so I use that because it's easy. no, still haven't but I did hand sew a patch onto vaughn's jeans that we hanging out on top of the sewing machine box. baby steps!